A podium appearance and more World Championship points were the rewards for the Honda Civics performance after a tough weekend at the Salzburgring circuit in Austria. Following the qualifying penalties that relegated the cars to the back of the grid for race 1, the strategy was to bring the cars home safely and then attack for race 2 when the original grids are reversed. 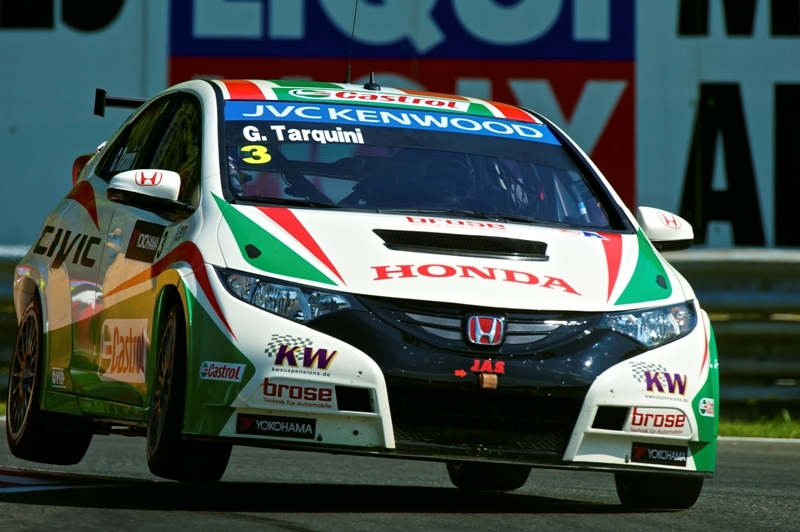 This placed Norbert Michelisz in the Zengo Motorsport Civic on the front row with the Castrol Honda team cars of Tiago Monteiro on the second row with Gabriele Tarquini in fifth position on row 3. Race 1 performance was controlled as planned but the Civics did advance through the field and inherited some positions when cars ahead crashed or retired. Tarquini finished 12th followed by Monteiro and Michelisz. Off the line from the start of race 2 Michelisz led into the first corners before being passed by James Nash. Norbert clung on to the new leader for ten laps but could not find a way past. With two laps to go he was under further pressure from former champion Yvan Muller who stole the place on lap 10. Michelisz took the third step on the podium to confirm his third consecutive podium finish in the recent WTCC meetings in Slovakia, Hungary and now Austria.